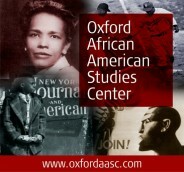 The comprehensive guide to African American and African history and culture. Since the promulgation of the revised missal, popularly known as the Novus Ordo by Pope Paul VI, with the Apostolic Constitution Missale Romanun in 1969, a growing call for either a return to the Tridentine Mass or recognition of the legitimate place of such a rite alongside the Novus Ordo has gained an international status. Groups like the International Una Voce Federation and recently, the Ecclesia Dei Society continue to advocate for this, and their cause has resulted in the Motu Proprio, Summorum Pontificum of Benedict XVI permitting the typical edition of the Roman Missal issued by Pope John XXIII in 1962. Africa has and continues to be part of this conversation. The International Una Voce Federation is actively present in South Africa and Kenya. Ecclesia Dei Society is present in Nigeria and works in collaboration with International Una Voce Federation. Some within these groups identify themselves as traditionalist Catholics stressing the point that they are truly the defenders of the deposit of Catholic tradition. Others argue that they are the true church and that the Roman Catholic Church has fallen into heresy. While these traditionalist groups share differing views on orthodoxy in relation to Roman Catholicism, their views on traditionalist Catholicism can be defined as an intentionality of meaning geared towards a consciousness that reveals the plenal hermeneutic-revelation of what is authentically catholic and traceable to ecclesial realities of the early church through a biased reading of church history. For an average catholic, traditionalist Catholicism refers to the schismatic group founded by Archbishop Marcel Lefebvre, C.S.Sp. However, other traditionalist Catholic groups continue to emerge, who sometimes have no allegiance to or do not trace their origins to Lefebvre’s Priestly Fraternity of Saint Pius X (SSPX). While the presence of Traditionalists in Africa is small, there is a growing awareness of the presence of these groups and interest in them by Africans. The SSPX has continued to make inroads in Africa and presently has a District of Africa, erected in 2008. Within the district, there are six priories located in five countries; two in South Africa, one in Gabon, one in Zimbabwe, one in Kenya, and one in Nigeria. The first was opened in Johannesburg, South Africa in 1986 and the most recent was opened in 2012 in Enugu Nigeria. There are twenty-two priests, two professed brothers, and eight sisters working in this District of Africa. Of these, there are currently two members of African descent, Rev. Gregory Obih and Rev. James Ngaruro. The former is an ex- Augustinian Friar-Priest from the Province of Nigeria, who left the Roman Catholic Church and joined the SSPX in 2007. He is currently the resident priest of the Priory in Nigeria. The latter is the first African ordained for the SSPX. 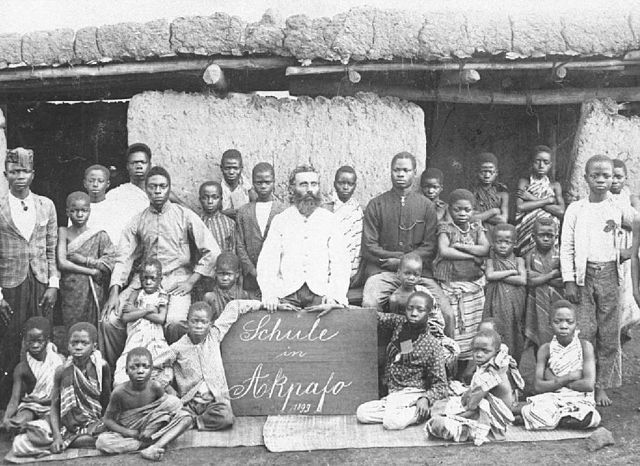 Missionary Andreas Pfisterer 1899 at the mission school in Akpafu, Volta-region of Ghana which was at that time a German colony by the name of Togo by Missionar der Norddeutschen Mission. CC-BY-SA-3.0 via Wikimedia Commons. Another group currently present is an offshoot of the SSPX. This is the Priestly Fraternity of Saint Peter (FSSP). This traditionalist group refused to follow Archbishop Marcel Lefebvre into schism when he ordained four bishops for his Fraternity in 1988 without papal mandate. The group became a Clerical Society of Apostolic Life of Pontifical Right. Its only presence in Africa is in the Diocese of Orlu in Eastern Nigeria. It runs a parish named Saint Mary’s Church with a canonical status of a personal parish without boundaries. The parish operates a Marian shrine called Nne Enyemaka Shrine (Our Lady of Perpetual Help Shrine). The only African member of the FSSP is Rev. Evaristus Eshionwu. He was ordained for the Diocese of Orlu in 1972 and incardinated into the FSSP in 1999. He is currently the associate pastor of the parish. Though, there is no other presence of this group in Africa, a noticeable rapport exists between the retired bishop of Orlu Diocese, Nigeria, Bishop Gregory Ochiagha. He serves as their sacramental minister for administering sacraments reserved to the bishop for this growing community. Other traditionalist groups are currently making advances to Africa. Among these is the Traditional Roman Catholic Church, formerly known as the Old Roman Catholic Church of America, who, though tracing its origins to the Old Catholic Church under the Union of Utrecht, has cut ties with the Old Catholic Church accusing it of embracing Modernist views. It claims to be the real Roman Catholic Church, arguing that it has preserved the true teachings handed down from the apostles. While the FSSP has accepted the teachings of the Second Vatican Council, by implication of its communion with the Roman Catholic Church, the SSPX continues to regard some aspects of the teachings of the Council as heretical and deviates from orthodoxy. The Traditional Roman Catholic Church rejects the Council and declares all its teachings heretical. This group is currently headed by Archbishop Mosley who styles himself as His Eminence Shermanus Randallus Pius Moslei, D.D., Primate of the Traditional Roman Catholic Church. This group currently has two African members; one of them is Rev. Cyril Nnadi, an ordained Roman Catholic priest of the Diocese of Umuahia in Eastern Nigeria. He left the Roman Catholic Church and joined the TRCC in 2007. He has served as their judicial vicar since 2009. The other African member is Rev. Hippolyte Marie Pagan from Cameroon who serves as the dean of their online seminary training as well as the legate to the African region. Tensions continue to brew between followers of the SSPX and those of the Priestly Fraternity of Saint Peter. They accuse the latter of betraying the cause of the traditionalist by submitting to the ‘Modernist” Roman Catholic Church when it established communion with the Pope in 1988. Both the SSPX and the TRCC stress a literal understanding of extra ecclesiam nulla salus (outside the church there is no salvation), defined to mean an actual membership in the Catholic Church that their groups now represent along with those ecclesial groups they are in communion with. Consequently, they reject categorically the teaching on ecumenism. They are also against religious freedom by consequence of their reading of the theological statement of Cyprian of Carthage. These traditionalists regard the writings of Michael Davies, a former president of International Una Voce Federation, and The Remnant, a bi-monthly newspaper as their vade mecum. Persons seeking to join these groups are first asked to read the works of Davies on the meaning and beliefs of traditionalist Catholics. Even though The Remnant claims to be an independent traditionalist catholic newsletter, its contents clearly favor the causes of the traditionalists. It updates its members globally on the progress of the traditionalist Catholic movement in the continent of Africa and also helps to raise awareness on how to raise funds to support the projects of the traditionalist groups operating in the continent. Featured image: Catholic Church in Mombasa by Zahra Abdulmajid. CC-BY-SA-3.0 via Wikimedia Commons. Randall Woodard is Associate Professor and Chair of the Theology Department at Saint Leo University. He is the editor of the International Journal of African Catholicism and some of his publications have appeared in America, Teaching Theology and Religion, Horizons, The Canadian Journal of Educational Administration and Policy, and The Catholic Social Science Review. The Remnant is a periodical that supports and encourages fundraising for the SSPX schism in a major way. The editor supports the schism. The Remnant consistently attacks the Holy Pontiff and the Magisterium of the Roman Catholic Church. SSPX is not a schismatic group. Please check your facts before posting. Thank you and GBU. Donatus, thank you for your politeness; I truly appreciate it. Tragically, the SSPX is taking many souls to hell, not the least of which are the priests who lead this schismatic movement. All SSPX priests and bishops are strictly forbidden, under penalty of the gravest mortal sin, from offering public Catholic Masses and administering Catholic sacraments. All marriages witnessed by SSPX priests are not only illicit (gravely sinful) they are INVALID. Those who willingly participate in these invalid marriages and then present themselves for Holy Communion are inviting the worst punishment in the hereafter. The sacrament of penance, when administered by an SSPX priest is also invalid, unless the recipient is in true danger of death and has no recourse to a Roman Catholic priest in good standing. No SSPX priest carries a Celebret. The Pontiff has directed the Superior of the SSPX to sign a profession of faith and return to the Roman Catholic Church. SSPX Bishop Fellay and his followers have refused to submit, for well over a quarter of a century. The SSPX priests move into jurisdictions governed by Catholic bishops and set up their own parishes, schools, seminaries, even marriage tribunals without ever asking for permission of any kind. Yet they fraudulently say they report to these same Catholic bishops, or that these men ARE their bishops. They lie. It is a deadly, evil, treacherous catastrophe. And the Adversary is delighted. Archbishop Marcel Lefebvre was one of our holiest and most accomplished Catholic prelates. His Excellency did incredible work throughout the continent of Africa as a leader of the Holy Ghost Fathers. He was most likely predestined for the highest rungs of heaven. Archbishop Marcel Lefebvre established the SSPX and then plunged this movement into schism. He died in a STATE OF EXCOMMUNICATION. If anyone is unclear about what this means, call your local seminary and ask for the rector or the spiritual director. The terrible fall of this very holy prelate, who had done such great service to the Church and Our Lord, is nothing to celebrate. It is a great, a very great, tragedy. Again a tremendous victory for the Adversary. Its snare did its deadly work. A schism is taking the lance and thrusting it once again into the Most Sacred Heart of Our Lord. Obviously, a Roman Catholic is unable to make his or her Sunday obligation by attending an SSPX Mass. To receive Holy Communion in a state of mortal sin is a grave evil. For a priest to offer Holy Mass in a state of mortal sin is a sacrilege. So apparently the SSPX are the only ones going to hell now that Pope Francis has declared that even atheists can go to heaven. I would like to draw Catherine’s attention to the fact that the current pope has supposedly conferred the faculty of obsolving sins to the SSPX. Also the holy office already pronounced on the validity of Sunday obligation in SSPX churches when it over turned the excommunication of people attending it’s chapels in Hawaii. I would also remind her that calumny is a grave sin. The authors’ assertion that Rev. James Ngaruro is the first African to have been ordained in the SSPX is incorrect. I knew Fr James prior to his entry to the seminary and can assure them that at that time there were already South African, Zimbabwean and Gabonese priests in the SSPX. Am searching for The Tradition Catholic church in kenya,kindly help. “…their views on traditionalist Catholicism can be defined as an intentionality of meaning geared towards a consciousness that reveals the plenal hermeneutic-revelation of what is authentically catholic and traceable to ecclesial realities of the early church through a biased reading of church history”. I am a traditional Catholic who leaves in Lagos-Nigeria. I intend to go to confession but can hardly find a validly ordained traditional Catholic priest. if he rejects Baptism of desire and Blood.